Published: Oct 25, 2013 to ? Arte was born into an aristocratic family in Florence during the 16th century Renaissance era. Being female, it was unheard of for one to become an artist. Driven by her love of art, Arte is willing to cast aside her aristocratic lifestyle to become an artist. Arte was published in English on Silent Manga Audition website from August 25, 2015 to December 25, 2016. 17 chapters were published before release was halted. Occasionally, after a long time reading and exploring different mangas, you are bound to hit a jackpot. "Arte" is a true MASTERPIECE. Even though I have read until chapter 47, each chapter has roughly 40 pages. Thus, I feel that it is a great time to give this manga a review. With all of these factors combining together flawlessly, it is not easy to give this manga's story set up a low rating. Don't want to get into the story because you guys should dive into this manga by yourselves. The level of detail in this manga is OMG. 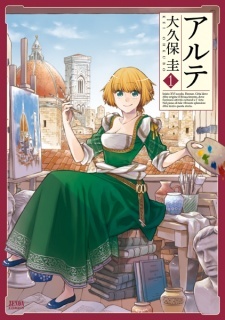 So since this artwork focuses on the era of Renaissance, the Mangaka has to make sure that his manga will give us a feeling of European/Italian style while he also has to make sure that what he draws actually represents the area or era he draws. This Mangaka definitely had done his research and intensive sketches before drawing all those places. They are too nice and real to be drawn without visiting Italy. Also, since the main character, Arte, is an artist herself. The Mangaka also has to draw the portraits as detailed as he can draw. I admire the dedication of the Mangaka. The character setup isn't random at all. So far, there are no extra characters in the story. Each character serves their purpose in the story and continues to grow and develop as the story goes on. I admire how the Mangaka is able to set up these characters and make them seem so real. Each character has their own struggles and purposes, and each character is unique. Can't stop reading this manga. Legit can't sleep until I finish this manga upon first touching it. As a huge history lover, I am glad to read a manga that correlates with a historical background. With great art and story, it makes me feel that giving this manga a 10 is pretty unforgiving. It definitely deserves something a lot higher( maybe 11 or a 100?). Reading this manga makes me feel like reading a novel while drifting on a Gondola that isn't only in Venice.